A display of Japanese flower arrangement (Ikebana) and a calligraphy scroll made by Ms. Ishibe will be on display to discuss the significance of art as part of the tea ceremony. Keiko Ishibe has been practicing Japanese calligraphy, or shodo, since the age of 6 and is ranked 7th dan in the Yugensha School. She also has a professional license to teach Japanese tea ceremony of the Omotesenke School and Japanese flower arrangement of the Ikenobou school. 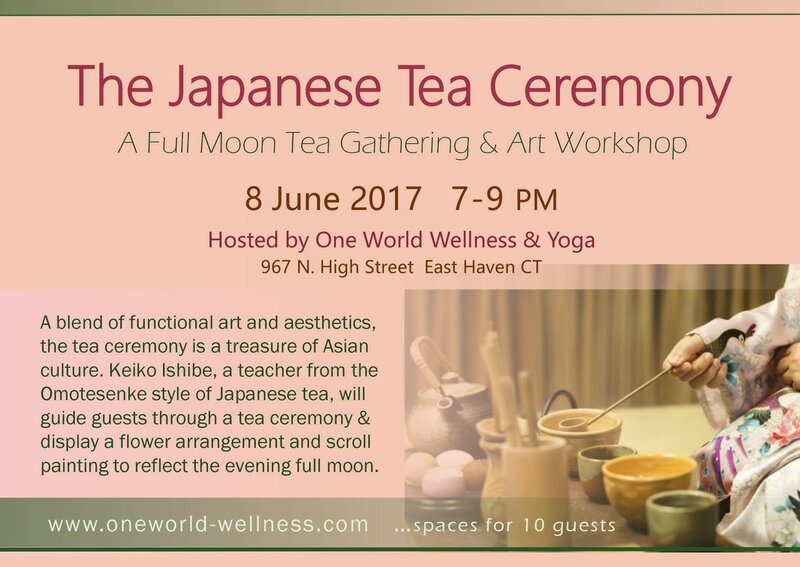 ​The evening's theme is the full moon in spring, and weather permitting, will be held on the patio of One World Wellness' Asian-style tea garden. Before the tea ceremony, guests are invited to view a presentation on the culture and history of the tea ceremony in Japan. Keiko Ishibe demonstrating the tea ceremony during a Yale School of Management Noon Seminar.